48,000 articles were woven as a Christmas gift for all employees in Danfoss Denmark. The largest order ever for Klässbols Linneväveri. 98 million meters of blue yarn was used to make 24,000 napkins and 24,000 tablets. The work in itself was a nice challenge for the company and a unique opportunity to show that we can receive really big orders. 1988 we started manufacturing pure linen table cloth and napkins for all Norwegian embassies around the world in the pattern ‘Norway’, in behalf of the Norwegian Ministry of Foreign Affairs. At The Dylan in Amsterdam, The Netherlands, you can visit the luxury suite Klässbols, where the whole hotelroom is decorated with Klässbols Bolster fabric. Since 1981, we manufacture table linen and napkins for all Swedish embassies around the world in the pattern of ‘Tre Kronor’ (Three Crowns), in mission of the Swedish Ministry of Foreign Affairs. Klässbols Linneväveri and the Red Cross have a product collaboration around the runner and the napkin / towel in the “Trust” pattern, sold for the benefit of the Red Cross. The linen products are red and white and are made for a Christmas table or why not a party time regardless of the season. The trust collection includes a two-pack runner (50×150 cm) and a two-pack handkerchief (50×70 cm) sold in the Red Cross Webshop. Half the sum goes to the Red Cross’s Christmas campaign 2011 Never alone, whose purpose is to combat unwilling loneliness and exclusion in our country. On Sunday, May the 17th, 2015 just before the wedding of Prince Carl Philip and Miss Sofia Hellqvist at the Royal Palace, Governor Kenneth Johansson handed over the gifts from Värmland. The country’s gift for the wedding couple consists of three parts. The first part being a commitment to protect nature in the soon formed nature reserve, Byamossarna in Arvika municipality. 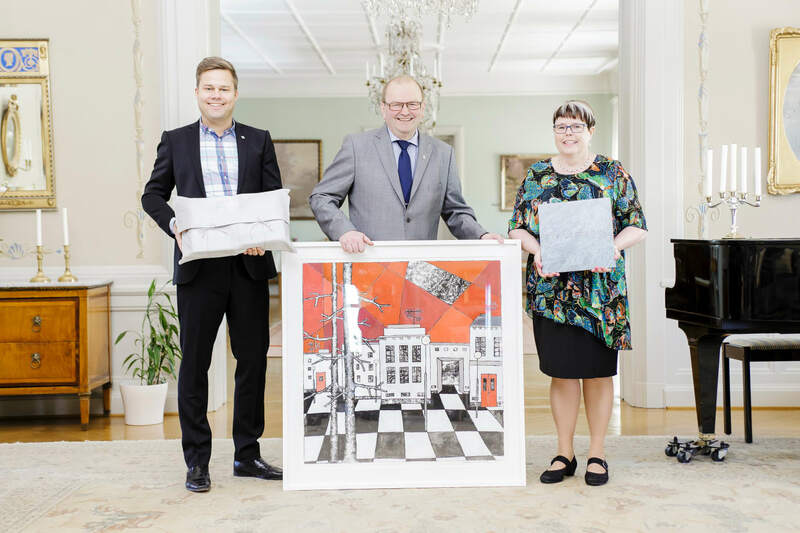 Through the support of the business community in Värmland, the governor also handed over a work of art by Karlstad artist Karolina Nolin and custom-designed linen products from Klässbols Linneväveri. In the products, which are part of Klässbols Linneväveri’s new collection “Ack Wermeland”, the designer Margot Barolo has received inspiration from the thermal-like nature, especially the nature of the Byamossarna. – The table cloth has got its pattern with the help of Värmlandsvisan, which describes a love for nature. The letters and words form a pattern of stripes flowing over the tablecloth. The pattern of the napkin reflects the mosses and other vegetation that are typical of the Byamossarna nature reserve. The motif is abstract and the sizes are distorted. In addition, the strips are inspired by the map’s name for wetlands and marshes, says designer Margot Barolo. The set consists of a tablecloth and twelve unique napkins in the cave with the wedding couple’s common monogram inväft. The whole gift is wrapped in a specially made linnen bag, even this with the wedding couple’s monogram inväft. Read the full press release from the County Administrative Board here. 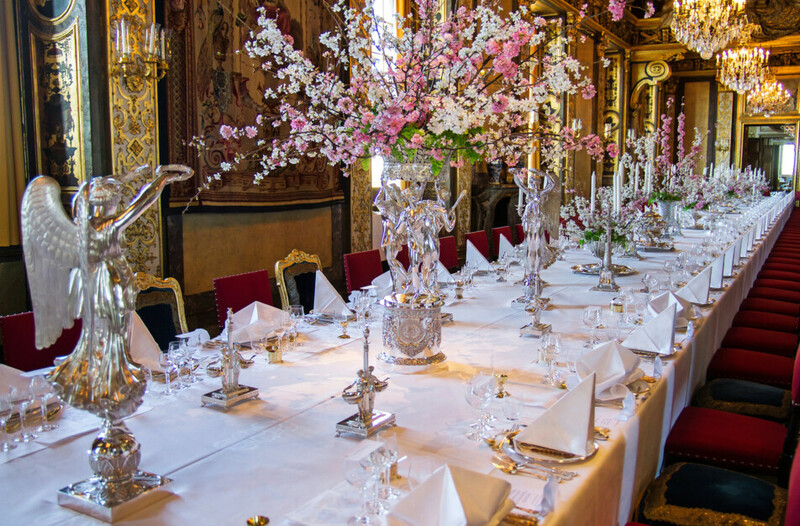 Since 1991, the annual Nobel banquet is served with table linen and napkins made ​​of Klässbols Linneväveri. The Nobel tablecloth and napkins are typical of the craft tradition at Klässbols and was designed especially for the 90th anniversary of the Nobel Prize in 1991. Textile designer Ingrid Dessau chose to make the tablecloth in satin with coarse, silver-grey linen yarn of the highest quality. The classical woven check pattern appears when the light is reflected differently by the surfaces of the weft and the warp. The napkins are woven in damask with thinner contrast threads of semi-bleached line yarn – the perfect complement to the beautiful tablecloth. The Company has been purveyor to the Court of Sweden since the late seventies. On the occasion of the jubilee commemorating King Carl XVI Gustaf’s 20th anniversary as King in 1993, the Swedish Parliament presented him with nine three-metre wide linen tablecloths and 200 napkins for the royal table. The tablecloths were hand-woven on special Jaquard looms. 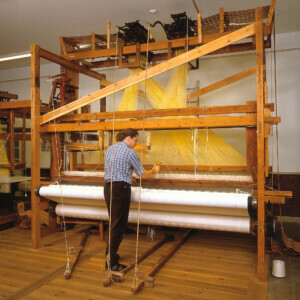 Furthermore Klässbols Linen Weaving Mill has been honored to provide the Court of Sweden with exclusive custom-made furnishings, Bolster fabrics and curtains. The title “Purveyor to His Majesty” is a personal and rare title. Swedish King Carl XVI Gustaf views recipients of his honour as “modern representatives of the best of the Swedish craftsmanship tradition” (from the book ‘By Appointment to His Majesty the King of Sweden’). Until now, King Carl XVI Gustaf has issued about 130 royal warrants. The holders are all representatives of Swedish companies and they come from a wide variety of enterprises. The issuing of royal warrants is restricted and they can only be granted by H.M. the King and H.M. the Queen. Only a few of the applications received each year by the Office of the Treasurer of the Court are approved for the title of Purveyor to His Majesty. To be eligible for the title of Purveyor to His Majesty the company must have been in business for at least five years and managed its finances in an irreproachable manner. Swedish royal warrants are directly linked to a specific member of the Royal Family. Upon the accession of a new monarch the warrant becomes invalid and the company must apply anew for the prestigious title. The title is also personally awarded to the head of the company and, when there is a change in the post of managing director or owner, the company must apply for renewal of its status as Purveyor to H.M. the King.